Wine geeks are always writing about the vessel a wine is made in. Cement tanks have made a coolness comeback this year, as part of the tradition backlash. Then there are small oak barrels, large oak barrels, old oak casks -- most winemakers talk about their winemaking vessel as a key ingredient. 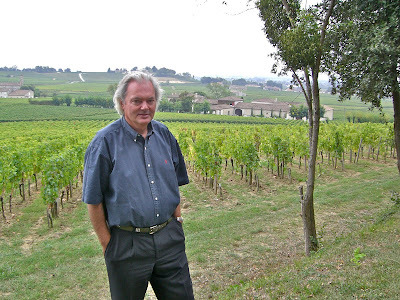 I was fortunate enough this year to visit Chateau Angelus in France's Saint-Emilion region, and to have lunch with owner Hubert de Bouard in his home (his wife made amazing pasta with truffles). Before visiting the winery (which you can see in the background of the photo), I asked him what he made his wine in. "Haut-Brion is made with stainless steel, Margaux with wood, Petrus with concrete. Sometimes they make good wines. For me, the vat is the vat, the wine is the wine." That's my wine quote of the year. Merci, Mr. Bouard.